This soup could not be easier to make. 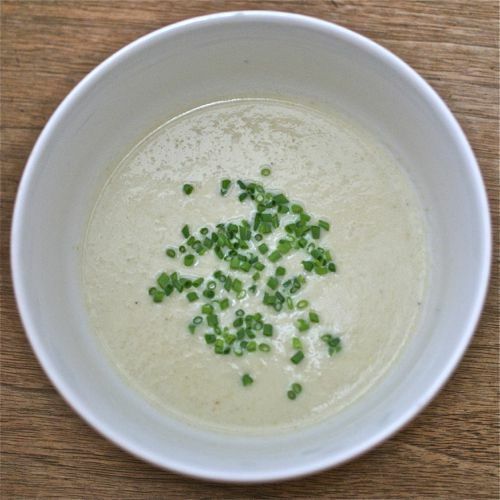 Just saute a few aromatics, boil them in broth with the endives, puree, and add cream. It's warming and comforting and full of flavor. Serve it as a starter to a larger meal, or as the main event with a winter salad and crusty bread for an easy, casual supper. Peel and finely chop onions and/or clean and finely chop leeks. Set aside. Heat butter in a medium pot over medium-high heat. Add onions or leeks, sprinkle with salt, and cook, stirring occasionally, until onions are soft, about 3 minutes. Meanwhile, chop the endives and then add them to the onions/leeks, stir and cook until the endives are wilted, then add the broth. Bring to a boil. Reduce heat to maintain a steady simmer and cook until the vegetables are all very tender, about 10 minutes. Return soup to pot and add cream. Adding just 1/4 cup will just smooth out the edges of the soup. The more you add the thicker and more luxurious the soup will become. Add nutmeg. Add more salt to taste, as well as pepper. Serve hot, garnished with chopped chives, if you like.